Updated: Intel has confirmed that these indeed are the six new desktop chips as well as release date and pricing information for the entire F-series CPU family. With the launch of Ryzen 3rd Generation processors just around the corner, Intel has headed AMD off and used its CES event to announce six new 9th-gen Core processors, ranging from Core i3 to Core i9, set to release soon. 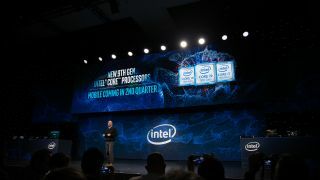 The new processors join the company's three existing 'flagship' 9th-generation desktop chips, which launched in October last year – the Core i5-9600K, i7-9700K and i9-9900K – as well as the 9th-generation X-series for HEDT systems. What's perhaps most intriguing about them is that five of the six new chips are part of a brand new F-series of processors, which have removed (or most likely disabled) the integrated graphics chip that almost every mainstream Intel processor has included up until now. One would think that these stripped down processors might be an attempt to reduce costs (as it will allow the chip-maker to sell CPUs with non-functional GPUs) – unfortunately that isn't the case. Rather, Intel plans to sell its integrated graphics-less F-series chips at the very same prices as it traditional desktop processors. From this pricing scheme Intel shared with us, we can see the Intel Core i9-9900K and Intel Core i9-9900KF are both priced at $488 (about £380, AU$690) despite the latter CPU missing one key feature. The same pricing trend can be found on the Core i7-9700KF, Core i5-9600KF and even the Core i5-9400F. It's a baffling product stack and we triple checked its authenticity with Intel just to make sure it was right. Before you get too riled up, Intel assured us that these aren't prices meant for consumers, but its commercial partners (such as system integrators like Dell and HP). So the good news is Intel doesn't plan to rip off consumers, but its partners? We're not sure how this seems like a sound business strategy to Intel, but at the very least we'll get more desktop processors soon. The Core i3-9350K will be the first entry-level chip from the Intel's Coffee Lake Refresh family. Priced at $173 (about £140, AU$240), the Core i3-9350K will also be the first F-series chip set to arrive this month with more rolling out through the second quarter of this year.